A fleet of spacecraft are diligently studying the global dust storm currently encircling Mars. Much as storm chasers would do on Earth, they are collecting valuable data so that scientists can better understand how these storms form and evolve. The current dust storm began as a small regional event in early June. By June 20 it had become the first global dust storm on Mars since 2007. With seven spacecraft actively observing Mars, scientists are getting their most comprehensive look yet into the behavior of global dust storms. NASA’s Opportunity rover is in a “safe mode” due to a lack of sunlight to charge its batteries. Four additional NASA spacecraft are observing the storm from the planet’s surface and from orbit. In addition, the European Space Agency’s (ESA) Mars Express and ExoMars Trace Gas Orbiter (TGO) and India’s Mars Orbiter Mission (Mangalyaan) are also observing the ongoing storm. As all of the spacecraft were designed for different missions, each has been able to tailor their observations to best utilize their on-board instruments. The Indian Space Research Organisation (ISRO) has been quiet about any dust storm observations that Mangalyaan may be collecting. The spacecraft is known to be equipped with a suite of instruments to examine the atmosphere that it could be using to monitor the dust storm. It is capable of collecting temperature readings of the surface and examining the composition of the planet’s exosphere and how that might be changing during the storm. It is also equipped with a color camera and can make visual observations of the storm’s evolution. ESA’s Mars Express is able to collect measurements of how the atmospheric composition changes during the storm. It is also equipped with a High Resolution Stereo Camera (HRSC) that can capture detailed images of the storm’s progress. A recently released image shows the leading front of a smaller dust storm near the north polar cap in April. The Visual Monitoring Camera (VMC) is a web camera mounted to Mars Express that offers lower-resolution views of the planet. An image tweeted out by VMC on Wednesday (July 25) showed a substantial decrease in the coverage of atmospheric dust revealing surface features, such as Valles Marineris, for the first time in several weeks. As the name implies, the Trace Gas Orbiter is equipped to monitor the seasonal concentrations of trace gas compounds in the martian atmosphere. Specifically methane but also water vapor, nitrogen oxides, and acetylene. It is currently not known to what extent a global dust storm can impact the seasonal variations of methane and other volatiles in the atmosphere, and the spacecraft is in prime position to make observations that could address these questions. TGO is also monitoring seasonal variations in the atmosphere’s temperature and composition to help refine existing climate models. Understanding how these factors have changed in the build up to, during, and after the current dust storm settles should help scientists to better predict the timing of the onset and cessation of future global storms. NASA’s Mars Reconnaissance Orbiter (MRO) has two primary instruments that are examining the dust storm – the Mars Color Imager (MARCI) and the Mars Climate Sounder (MCS). MARCI maps the entire planet at mid-afternoon each day to track the storm’s motion and evolution to facilitate the creation of planet-wide weather maps. These maps are utilized by the Opportunity and Curiosity mission teams to help plan activities around Mars’ weather. MCS measures the temperature profile of the atmosphere and can track how temperature gradients in the atmosphere change throughout the course of the storm. Similar to weather patterns on Earth, differences in temperature can drive small to large-scale shifts in wind patterns that impact the circulation of air in the atmosphere. Understanding when, where, and why air is falling and rising across different areas of Mars is key to understanding how storms go global. Mars Odyssey’s THEMIS instrument (Thermal Emission Imaging System) enables scientists to track the planet’s surface and atmospheric temperature as well as the amount of dust in the atmosphere. By monitoring dust levels in the atmosphere, scientists can directly track the storm’s initial development, growth, and eventual dissipation. “Every Mars year, during the dusty season, there are a lot of local- or regional-scale storms that cover one area of the planet,” Smith said. In an attempt to better understand how dust storms go global, the frequency of global THEMIS observations have been increased from once every 10 days to twice per week. The Mars Atmosphere and Volatile Evolution Mission (MAVEN) arrived in orbit above Mars in 2014. It was launched to investigate the history of the Martian atmosphere, which is believed to have been considerably more dense in the early life of the planet. To understand how the atmosphere has gradually eroded though time, MAVEN focuses most of its instruments on the planet’s exosphere and the boundary between the atmosphere and space. Rather than studying the dust storm directly, the MAVEN team is looking to see how the dust storm impacts the upper atmosphere. It is now thought that the planet lost a considerable amount of its atmosphere due to the solar wind around 3.5 to 4.0 billion years ago based on recent observations by MAVEN. As the dust storm progresses, the spacecraft will investigate how dust storms influence the present-day loss of molecules from the upper reaches of the Martian atmosphere. These observations should help to refine modeling efforts of the atmosphere’s evolution. While scientists wait for Opportunity to reawaken, the Curiosity rover is weathering the storm as the only spacecraft transmitting observations from the surface. 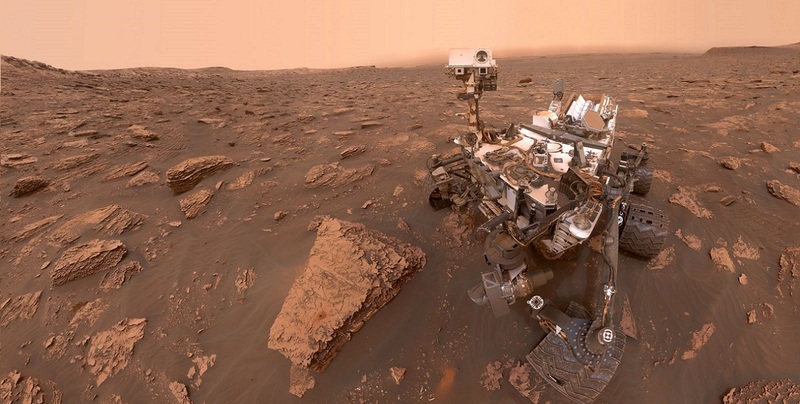 The nuclear-powered rover is not affected by the reduction in sunlight due to dust in the atmosphere, so it is able to continue as normal, however it is collecting additional storm-related observations. The lander is equipped with a weather station, the Rover Environmental Monitoring Station (REMS), that can provide direct surface measurements of the storm. REMS provides daily measurements including atmospheric pressure, humidity, wind speed and direction, as well as air and ground temperature near the rover. In addition to visible-light cameras such as Mastcam, the spacecraft’s ChemCam and an ultraviolet sensor on REMS can collect information on how the abundance and size of dust particles in the atmosphere change with time. Another characteristic of global dust storms scientists are seeking to understand is their regularity. On average, global dust storms occur once every three Martian years (5.5 Earth years). The current storm is overdue in that respect as the last global dust storm occurred in 2007 (11 Earth years ago). Based on observations from the global dust storms in 2001 and 2007, scientists do not expect the ongoing storm to wind down until September. Even if dust persists in the atmosphere beyond then, it is not expected to impact the scheduled landing of the solar-powered InSight mission in November. Observations of the current dust storm should provide scientists with a wealth of data to analyze in the years ahead.